Approximately 80% of the World’s Population is Non-English Speaking, and Email Service Providers have been Neglecting to serve the Non English Speaking Population and hence they were Unable to Communicate in their Own Languages Via Web and E-Mail Addresses. Data MyXgen Technologies Pvt Limited, a Leader in Email Technologies from India is Sensitive Towards Non English Speaking Population. What is Internationalized Domain Name (IDN)? Internationalized domain name (IDN) is a domain name or URL with local language characters instead of English /Latin or ASCII Characters i.e (0-9, A to Z, a to z ) . IDN’s uses a particular encoding format that allows a wider range of script to represent a domain name. 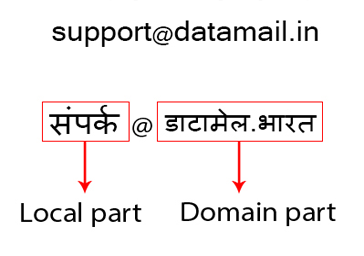 These are the domain name that includes Non-ASCII Unicode characters of scripts like Cyrillic, Chinese, Hindi, Gujarati and more..
What Is EAI (Email Address Internationalization)? Email Address Internationalization (EAI), also called IDN Email, is an international email address that contains international characters (Non-ASCII characters) in the local part, the domain part of an email address. XgenPlus Worlds Most Advanced Email Server is now EAI ready. XgenPlus is the first Enterprise IDN Email Compliant Solution that follows all EAI protocols and allows people to use almost any language in their e-mail addresses. XgenPlus allows organization and users to choose the desired e-mail address to be in any language following Unicode standard. 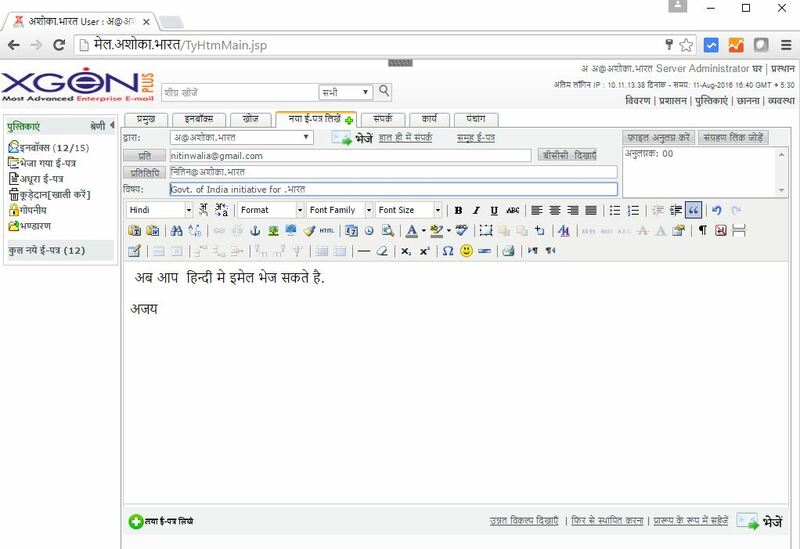 Like an Indian Hindi, speaking user can choose to have an email in HINDI and user from China may choose to have his email address in the Chinese language Mandarin script. You Can Contact Our Sales Team or Visit Any Registrar Website To Register a Domain Name as .भारत (.bharat) for Indian Companies and like wise other countries Contact IDN Domain Registrar Of Respective Countries. XgenPlus supports full EAI on IMAP/s, POP/s, WEBMAIL/s, SMTP/s along with downgrading. It uses Spamjadoo antispam which is EAI compatible. If Your Organization is Using XgenPlus Email Server, then You are Ready to use any IDN Email Id. Just Contact Your Administrator or If You Wish to Host Your Internationalization Domain Name (IDN) with us, Please Contact Our Sales Team Through Contact Us Page.